Rose Muzio, who had been a member of El Comité-MINP which started in the UWS in 1970, began her presentation by describing the harsh conditions in NYC for Black and Latinos in the 1950s and 1960s. She asked why in the 1940s and 1950s did so many Puerto Ricans leave their beautiful island. Her answer was PR is a colony. Mainland companies took much PR agricultural land for manufacturing leading to high unemployment. Local governments encouraged migration so as to deal with the unemployment and discontent. For a while there were manufacturing jobs in NYC. When NYC deindustrialized in the 1960s and 1970s, more than 500,000 jobs were lost. Unemployment among Blacks and Puerto Ricans was two times the overall unemployment rate in NYC. Meanwhile school segregation was increasing and Blacks, Puerto Ricans and Dominicans were on average charged higher rents for worse housing than other people. But this was a time of decolonization and rising expectations around the world. The anti colonial movements, the Cuban Revolution for a more equal society and the anti-VN War movement were inspirational. Resistance groups and movements in the US arose to oppose economic inequality and racism, e.g., the Black Panthers, the Brown Berets, and in NYC CORE, the Young Lords, student groups at Columbia and CUNY and worker groups. After emerging in 1969 in East Harlem, a branch of the Young Lords advocated for community control and independence for Puerto Rico. In a famous garbage offensive they gathered the garbage that NYC did not remove from East Harlem streets and made a big heap on Third Ave, lighting it on fire. The resulting media coverage raised the profile of Puerto Rican grievances. Rose Muzio gave this as background for the UWS squatters movement called Operation Move-In* that opposed urban renewal (urban removal). In 1970, after a young boy, Jimmy Santos, died from carbon monoxide poisoning in a first-floor apartment on West 106th Street, anger exploded. People broke into buildings that were boarded up waiting for demolition as part of urban renewal and occupied them by moving families in. This was followed by a group of young Puerto Rican and one Dominican softball players occupying a storefront on Columbus Ave near 88th Street. Those young Latinos became El Comité. Over time El Comité transformed into a political group which won the first district-wide bilingual program. That program benefited all the mono-lingual students. El Comité forced Channel 13 which was a public TV station (PBS) to do a series on Latinos in NYC. They did that by breaking into the station while it was on the air and making a statement that was broadcast live. El Comité started a Latina unity organization that gave strength to women to take on many challenges. El Comité formed a Black and Puerto Rican construction workers coalition which forced the city to open its construction jobs across race lines. They issued a bi-weekly newsletter, Unidad Latina, which routinely contained articles addressing local issues as well as the struggle for independence in Puerto Rican. There were also projects that did not succeed but El Comité inspired people and drew them into more collective action. Rose Muzio ended her presentation by saying El Comité helped her set the foundation for her life and her life’s work and continues to inspire former members and those touched by the group which disbanded in 1986. Next, Máximo Rafael Colón showed many of the wonderful photographs he took documenting the marches and struggles in the 1960s and beyond. In his photos were many of the activists that went on to be leaders in the movements that emerged. Interesting to me many of them became journalists** like Pablo Guzman and Juan Gonzales. Colón called attention to the Puerto Rican political prisoners over the years and especially Oscar López Rivera who is still in prison after 35 years. Oscar López Rivera committed no violent crime. His crime was called sedition, thinking that there has to be a change, independence for Puerto Rico. Colón called Oscar López Rivera the Nelson Mandela of the Puerto Rican people. In 1971, the Young Lords and El Comité objected to the Puerto Rican Day Parade appearing as a spectacle of Puerto Rican compliance with the institutions of oppression. Some of the photos showed the fight against the Parade Committee. One photo showed activists marching in the parade. Colón also called our attention to the Broadway Local whose members were white youth facing the same contradictions and fighting for progressive change and to the East Harlem Rainbow Coalition which marched in support of the presidential candidacy of Rev Jesse Jackson. There followed a panel of four women, Carman Martell, Ana Juarbe, Annie Lizardi and Lourdes Garcia who lived and worked in the UWS and were politicized by the movement all around them. Coincidentally two of the women moved from PR to around 101nd St in the early 1950s. One of the women was three years old at the time the other was seven when they arrived from PR. The four women told about how they used their lives for social purposes. The last of the four panelists was Lourdes Garcia who told many details of the economic situation in PR today. 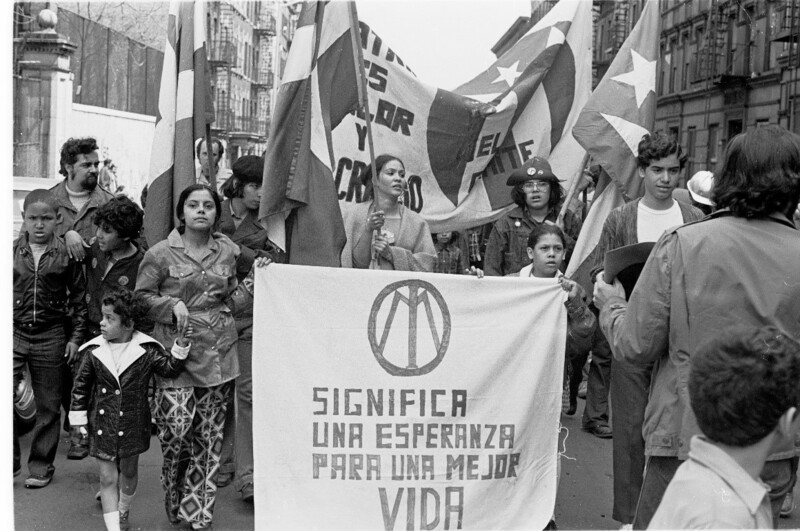 It was clear that the harsh conditions in the UWS in the 1950s and 1960s, the political activism these conditions gave rise to and the struggle for Puerto Rican Independence helped these women and many other people become conscious political actors for the rest of their lives. Factors such as urban renewal, the physical expansion of major institutions like Columbia University, and the lack of sufficient public housing made it very difficult for low-income families to find housing in New York City during the late 1960s. During the summer of 1970, communities responded with a squatter movement which installed over 300 families in vacant apartments across the city. Most of these squatted apartments, frequently slated for demolition in urban renewal areas, were owned by the city or by large institutions. Led by African-American and Latino families, this squatter movement received support from Met Council on Housing in the form of help with repairs, negotiations with landlords and fighting evictions. Squatters succeeded in delaying institutional expansion into Morningside Heights. Some landlords yielded to demands, providing services in squatted apartments and for a few, the right to remain in their new homes. The squatter movement gained significant media coverage, giving exposure to critical housing issues such as urban renewal, property speculation, long-term vacancies and the need for affordable housing. ** Legendary New York City newspaper columnist Jimmy Breslin once joked that the Young Lords, a militant Puerto Rican group, produced more great journalists than Columbia University’s journalism school. Several alumnae of the Young Lords did go on to careers as journalists after raising hell in the streets of Spanish Harlem. A few even made their marks in public media.